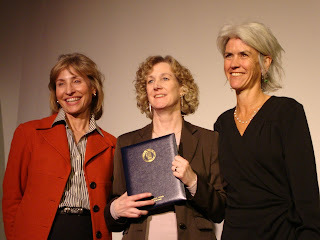 Yesterday, Legal Voice received the City of Seattle Distinguished Citizen Award for Human Rights. We’re honored. And we’re grateful that the Seattle community continues to strongly support our work. We must point out that the support of our donors, volunteers, allies and other like-minded folks is the only reason we’re able to do the work that earned us this award. Over the years, with lots and lots of help, we have passed hundreds of bills to enhance and protect women’s legal rights, and provided free legal information to more than 96,000 women and men. Last night’s chilly weather didn’t deter a roomful of Seattle’s most ardent human rights supporters from gathering at Town Hall to celebrate. We may have been red-cheeked and shivering when we arrived, but were quickly warmed by the welcoming buzz of dozens of smart people who work to make the world better. There was Sun Lik Zhou, a high school student who entices her teenage peers to talk about diversity and social justice through an ACLU club. Our longtime allies at Pride Foundation received some much-deserved recognition for doling out dollars and support in the LGBTQ community and beyond. Another award went to the women of De Comunidad a Comunidad, who do intensely important organizing work in Washington’s immigrant communities. And Joe Martin, a fierce advocate for low-income folks, raised the roof with his impromptu remarks, which were one part acceptance speech and one part consciousness-raising/call-to-action on behalf of Seattle’s homeless. The staff of Legal Voice is overjoyed to be included among this impressive collection of do-gooders. Thanks, Seattle. Photo: Lisa Stone, Executive Director of Legal Voice (center), with representatives from the City of Seattle Office of Human Rights.